Measure A strikes the right balance between providing road upgrades and mass transit projects for the growing number of residents in Oceanside and Carlsbad as these cities move forward together. The measure supports the growth of North County by providing traffic relief and improving the flow of travel for businesses, employees and residents. On Interstate 5 from Carlsbad or Oceanside it can take over 70 minutes to get to San Diego. The I-5 and Route 78 freeway interchange has an unnecessary traffic light. Route 78 is the most congested afternoon commute in the county. Measure A will fund $2.6 billion toward road repair and widen Route 78 with new lanes in both directions to relieve the worst rush-hour traffic congestion in the region. This measure will correct the bottleneck from Route 78 to I-5 south by replacing the stop light with a new freeway connector to provide a safe and smooth transition between freeways. 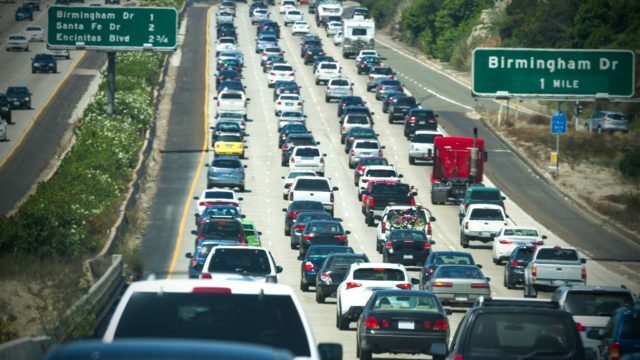 Once the carpool lanes on I-5 are completed, drivers will have a smooth transition around the county, and a new Coaster stop at the Del Mar Fairgrounds will relieve dreaded summer traffic. Under the current funding plan residents have to wait years before additional freeway dollars come to North County. Measure A accelerates dollars to fix I-5 and Route 78 within 15 years to reduce congestion and decrease commute times. The cost? A half-cent sales tax increase, all of which stays in San Diego County, not Sacramento, to fix our roads and repair our crumbling infrastructure. We usually oppose tax increases, but no one else is going to fix our traffic. Let’s do the right thing: fix I-5 and Route 78 and not leave this congested mess to the next generation. Vote “Yes” on Measure A.
Jim Wood is mayor of Oceanside and Matt Hall is mayor of Carlsbad. Both represent their cities on the board of the San Diego Association of Governments.